The Hoof + The Tone Reaper + an octave = The Hoof Reaper. 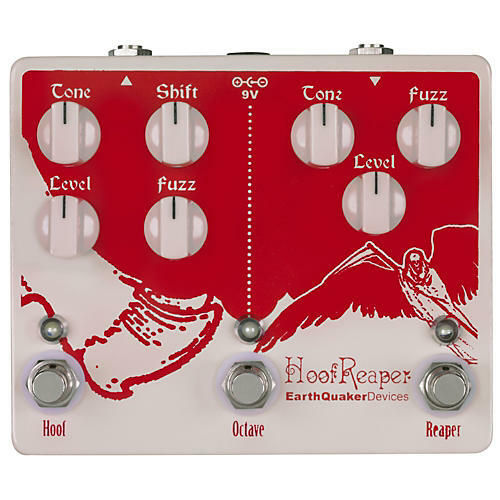 The Hoof Reaper features Earthquaker's popular Hoof and Tone Reaper fuzz pedals in one handy enclosure with the added bonus of an old school analog octave up. It was originally released as a special limited run item back in 2010 and demand was so high that they decided to reintroduce it back into their line on a semi-permanent basis. The Tone Reaper is a vintage style fuzz device based on the "3 knob" bender. It's a silicon/germanium hybrid capable of producing a wide range of tones from every bender era with careful tweaking of the tone and fuzz controls. From thin and spitty to thick growling sustain, it's all here. True Bypass and Handmade with sweet loving care in Akron, Ohio. Behold the ultimate fuzz in all of its glory. Measures: 5.5? x 4.5? x 2.5? with knobs. Power: A standard 9 DC power supply intended for musical instruments with a negative center 2.1mm barrel, 100ma minimum. We strongly recommend a high quality power supply with isolated outputs and good filtering to avoid unwanted noise. No battery Option.